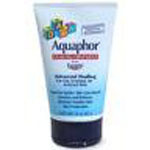 Aquaphor comes in a small tub and the cream is applied like most beauty creams, generously applied to the face or other afflicted parts of your body by rubbing with your fingers. This cream is supposed to moisturize and it is supposed to also help with healing damaged skin and dealing with eczema related symptoms. I found that this did not work so well for my eczema, but I have to say that it was good at keeping my delicate skin moist and happy. Instead of healing rashes and problems that already exist, this moisturizer works mainly as a way of protecting the skin from the effects of wind and water and other weather conditions. Usually when I get a product like this it is because I want to be able to deal with a skin condition that I am having at the moment. For example, if my skin starts to get red, I might stop in a convenience store and pick up something to rub on it and make it feel better. This product only works if you apply it to areas that you think might be afflicted in the future, which is not such a great strategy. I don’t want to coat my entire body in this stuff every morning. I don’t have the time or money. So if you know where you get affected all the time, rubbing this on will prevent it, but for people that don’t own crystal balls, like me, you should probably stay away from this.